Bad-influence boys. Illicit behavior. Illegal drugs. Dramatic avoidance of family get-togethers. 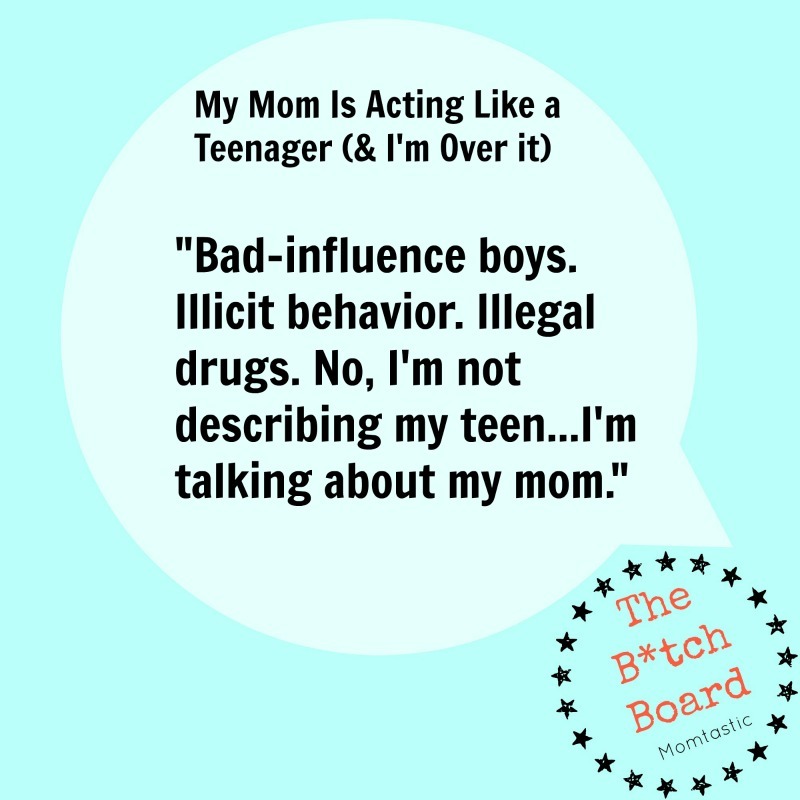 No, I’m not describing my teen (in fact, my kids are quite young). I’m talking about my mom, unfortunately. My mother got married straight out of college and had back-to-back kids while working full-time. After her amicable divorce from my father, she remarried the wrong guy and spent years working up the courage to leave. Now that we’re all grown and she’s single, my mom is finally living a much-deserved period of freedom and joy. I love watching her have some fun and enjoy a sort of “new 20s” — spending her hard-earned cash on vacations and clothes she never would have treated herself to when she had children to care for and was the primary breadwinner in both marriages. I think it’s kind of cute that there are Sunday mornings when I’ll call my mom and she’ll send me to straight to voicemail or answer in a throaty, “Call me later, hun. I was up late.” A lot of my mom’s behavior is pretty harmless, after all. She’s just enjoying the young life she never got to have back when she was young. But there’s more to the picture that’s really starting to irk me. 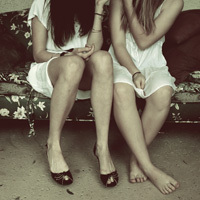 With this second adolescence has come a relationship with a younger man who is not a great influence. My straight-laced mom who always dug through our rooms looking for evidence of wrongdoing and totally lost her mind when she caught me, at 22, with a cigarette dangling out of my mouth, is now smoking pot in her home. The last time we went over, I had to leave with my kids because I didn’t want them near the smell, which was permeating. But, as if the temptation to lecture her on boys and drugs wasn’t bad enough, I really feel like I’m mothering my own mom when it comes to daily life and family relationships. This obsessive attachment to her new beau means that he comes before all of us, often at the expense of important family events like bridal showers, cousin get-togethers, and major holidays. She’s even kicked me out of the house during a visit to let him over when they didn’t have pre-existing plans. It’s the same bizarre behavior I displayed over my high school boyfriend who would call or not call, and had me hanging on his every word when he did come around. Isn’t she the very person who coached me through all of those tough years and told me how much better I was than that? Now, she’s dissolving in a puddle of tears when the guy makes a plan and then ditches her. It’s heart-wrenching. And annoying. My mom has cancelled numerous plans with me and with the rest of the family. She gossips like a tenth grader. And she even “jokingly” asked me to go into labor last year according to a timeline that wouldn’t preclude her from her social plans. We’ve fought over eyeliner. She sits around texting the whole time she’s babysitting for us. In short, my mother is a 15-year-old trapped in the body of someone who used to be the most empathetic caretaker on earth. Every single chat we have is riddled with (often repeated) stories about her guy and the nightlife. I have to fight to get a word in about my husband and kids, and she almost always interrupts me to describe her outfit in detail, brag about another pound lost, or repeat (again) the latest romantic story about the noncommittal dude. I’ve tried to talk to my mom about my feelings a few times, always related to a specific event and not the bigger picture. But it never goes over well. She is such a giving and generous person by nature, I think she feels attacked and criticized whenever someone suggests her actions are not in line with her true character. Moreover, the boyfriend clouds her judgement. I’m beginning to think that even if she did have some insight, she’d talk it over with him and he would convince her she’s done nothing wrong. At this point, I’d rather not discuss it with her. I just don’t want a fight, even though I know an honest conversation is probably what we both need. As a mom myself, I understand that my own mother loves my siblings and me more than anything. And whether this is a phase or just the way she is now, I won’t leave her side. She’s the best! But, this new version of my mama is bothersome and makes me feel like our relationship just doesn’t matter to her as much as it used to. I guess I’m just tired of having to be her mom when I have a family of my own to take care of.